Dragon: Real Life, Only Better. I read in Jonathan Jones’s column in today’s Guardian about Google Art Project. It works like the 3-D street-view part of Google Maps, except that you’re walking around some great art museums. In addition, you can zoom in on the paintings; you can get a 15 cm-wide image of Captain Koch’s eyeball in The Nightwatch. If you find that gratuitous, then zoom in on Lt. van Ruytenburch’s eyeballs, as I did, and see by comparing them how Rembrandt thought about drawing anatomy (or, at least, eyeballs). That’s something you wouldn’t be able to do at the Rijksmuseum; the Nightwatch is so huge you’d need a stepladder to get anywhere near the figures. Google has only catalogued a handful of museums so far. I miss being able to take a butchers at the Velázquezs in the Prado, though Google will presumably be expanding their collection at a comparable rate to the maps’. 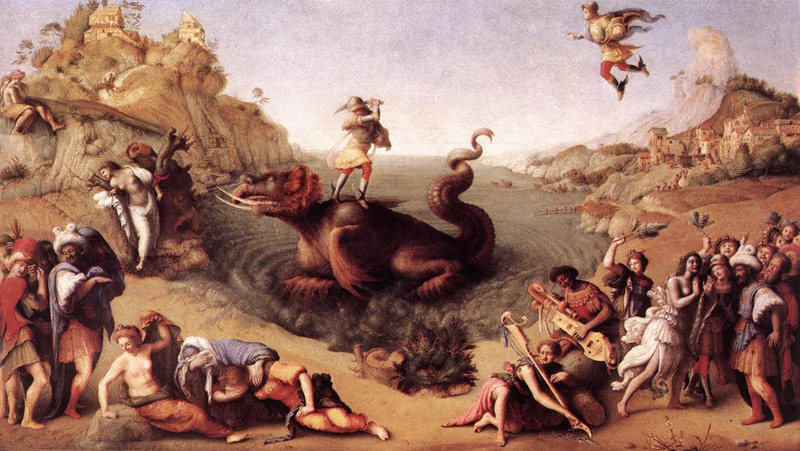 The Uffizi is already available; Jonathan Jones nudges us towards Piero di Cosimo’s painting of Perseus & Andromeda (above), which really is worth a detailed examination. Now they need to add an IM widget to it, so you can meet smart lonely girls. Now then, what you want to do for a wee break next January is to hie you to Edinburgh to see the Vaughan Bequest – a bunch of Turners shown only in January so that the light won’t damage them. Wonderful. Yes, it’s fabulous, I read it in today’s newspaper. But I’m lazy and hadn’t tried it until now. You guided me perfectly. But did you meet any smart lonely girls? Why you have to take away such a pleasure? Weep for someone else makes us forget why is that we want to weep for ourselves. 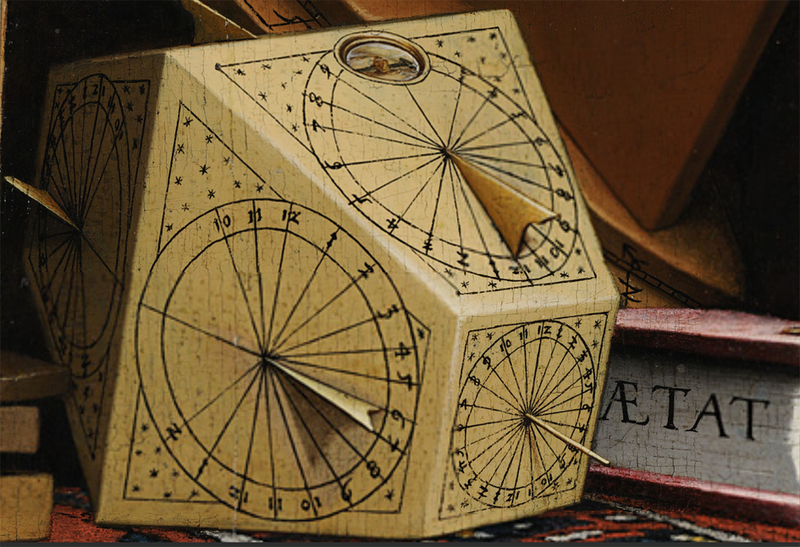 And that’s the compas, inset at the top of the sundial? So you can orient it properly? Wow! What a terrific view of the craquelure. You can make it even bigger than that if you need to. Talking of Argentina, I read an article in the New York Times’s wine section about torrontés. It’s like a muscat: “Dip your nose into a glass, and you don’t know whether it ought to be sold as a wine or a perfume”, says the article. It said that Argentina makes great wines from obscure types of grape, which made me want to try some; but they didn’t have any torrontés at the norskevinmonopol, so I had to settle for an Argentine red wine made from the equally unusual malbec instead. I’m drinking a glass now, and it’s really excellent. I’ll bring some bottles of torrontés the next time we meet. Oh, I had never heard of malbec until last year. (I am no more knowledgeable about high wine culture than about high musical culture.) But my wife bought a bottle on the recommendation of a wine-store employee last summer, and we liked it enough to buy more. I just visited the Hermitage and was stuck behind a party of digital schoolchildren for an hour. I like malbec a lot. I’ve also had some really nice sparkling wine from Argentina (sorry, can’t remember the name). Wish me luck, we’re going to Uruguay for 5 days. Good luck & good trip! Jesús, did I tell you my wife made the outside of the seedvault? Oh! I didn’t know. I’m amazed. Small world. It’s very nice there. You ought to go. Julia, thanks for that link to Père Lachaise. They are fantastic pictures.